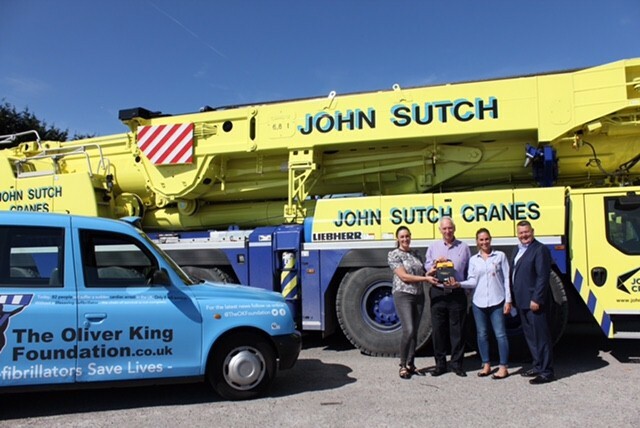 Crane and heavy plant hire specialists, John Sutch, has acquired two defibrillators, to be kept in the firms Liverpool and Manchester depot, as part of a pledge to the Oliver King Foundation. Twelve-year-old Oliver King, a pupil at King David High School in Liverpool, sadly died from Sudden Arrhythmic Death Syndrome, a hidden heart condition which kills 12 young people every week. It was later revealed that had a defibrillator been on site, the tragedy may well have been prevented and the King family has campaigned since to raise awareness of these issues, encouraging businesses and organisations to keep a defibrillator on site. Sisters and Directors at the firm, Hayley and Andrea Sutch, whose children both attend King David Primary School, met with Mark King of the Foundation, to learn more about the potentially lifesaving equipment, and have since invested in two defibrillators. The cause is close to the family’s heart, as a member of their family suffered from a heart attack in January 2016, making the issue a highly emotive one for the firm’s directors. Andrea Sutch, Director at John Sutch Cranes explained: “The passing of young Oliver really has touched us all, coupled with the situation with our own close family member. Following the campaigning by the Oliver King Foundation, we have been made aware of the many issues surrounding heart conditions in young and old people and how access to the right equipment really can save lives. The firm is now set to engage with nearby firms and organisations, ensuring they know that the equipment is there and available in an emergency should they need access.